In this episode, Harold Reitman, M.D. speaks with parenting and addiction specialist Jan Tedeschi. Jan discusses her own childhood exposure to alcoholism, the role neurodiversity and the brain plays in addiction, and why society’s perceptions of substance abuse may be making the problem worse. HACKIE REITMAN, M.D. (HR): Hi I am Dr. Hackie Reitman. Welcome to another episode of Exploring Different Brains. And today we have a visitor down here in Florida all the way from Marshfield Massachusetts. The parent thing and addiction specialist Jan Tedeschi. Jan Thanks for being here today. JAN TEDESCHI (JT): Thanks for having me. HR: How did you get into the addiction. JT: How did I get into addiction. Initially I thought it was accidental. Freshman year of college I was asked to do someone a favor and fell in a position. JT: No no no effects. Which actually kind of tied me into a detox and I went with that story for quite a while. But the reality is I’m the daughter of an alcoholic mother and she ran the detox and addiction was the last field I intended on going into. To be honest with you. HR: That’s pretty heavy duty. There’s a script. We got a script. So what was it like growing up. JT: It certainly gave me a first view hand view points of the stigma of addiction especially addiction for a female in the early 60s. There were very few women in a 12 step program back then. At the same token my mother was extremely affective professionally and saved many lives from what I’m told. But when it came to family members that fair kicked in for addiction and it was a very different picture there was a lot of turmoil and trauma with her inability to be effective with people in her life that were close to her. HR:Like they say in medicine you know parents should never treat a child. JT: Yes. Yes exactly. Yes. But the beauty of it was that in hindsight it taught me or provided me the desire to learn to do it differently. HR:What was your dad like. JT: My dad was very quiet, very patient extremely tolerant man and I didn’t have a lot to say but at the same token kind of began to understand addiction just by the very nature of being surrounded by it as I did. And soon chose to give up alcohol and decided to set an example. HR:How long you been doing this? JT: Since the early 20s since I was my early 20s. I actually started. Yes, a little bit a little bit past 30 Yeah. So it’s been a while it’s been over 35 years. HR:Have you considered like I do. 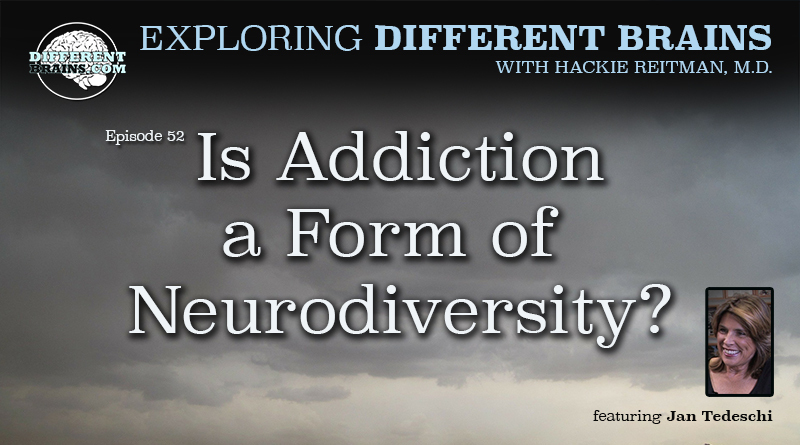 I consider alcoholism and addiction just another neurodiversity where the brain is wired differently. How do you feel about that? JT:It certainly affects the brain. There is no question about it. Not in my opinion and I am not a doctor. But research has shown us there is no question about it. And that’s where the reward center is you know which is what addiction can be all about that reward and pleasure which is in the brain. HR:A lot of the people you treat for addiction- do they have other co-morbidities with that? HR:Is there were some more common than many others what would they be? JT:A lot of anxiety a lot of depression some bipolar. It can really vary. There’s no question about it. And I think sometimes the hard part is many come in with a diagnosis but were diagnosed while they were using. Which really makes it difficult because until the drug is removed and they become clear sometimes the presentation can be very different. So sometimes what they’re treated for when they come in may alter when they leave. HR:Is there one particular thing about addiction and alcoholism that somebody like me would have no idea about. Just a layperson. John Q. Public just wouldn’t know about it. You realize that would like to share with our audience. JT:I think one of the things that come to mind is that the key component in working with addiction from my perspective and can be in many areas is really understanding that in many ways they’re no different than you or I. So much of what’s going on is very similar. And they kind of have the same basic human needs. Granted their way of obtaining them may have impacted them negatively and I think just being present and respecting them is really key because the shame and the guilt that goes along with addiction really interferes with their ability to relate or to understand that someone is genuinely there that cares, the guilt the shame and the guilt is huge in addiction. And the other key component is usually not always but usually their faith and their hope has been shattered which is really unfortunate. HR:There faith and there hope has been shattered. It’s sad. JT:It’s very sad very sad. And it’s one of the things I love doing in the field is finding an avenue or a pathway for them to open that door again. Because it’s really a key component for many. HR:OK so if I’m better, and I come to see you, what do you do? JT:Sometimes people will touch base with me. Yes. For a referral. But usually what I did was work in a treatment facility what I’m doing now is consulting to professionals because it’s a really misunderstood disease. And many of the therapists are trained in addiction. Many of your professionals aren’t specifically trained in addiction and really don’t understand the disease. And we’ve got many therapists sitting across desk that don’t understand they’re dealing with addiction which is..
HR:The same thing is true of Asperger’s- there is no training. HR:And for our audience what makes a drinker not what makes what criteria what are your criteria for when somebody just likes to drink and someone is an alcoholic. I know what they gave us in medical school. But what is your definition was like. You know I like to have a couple of drinks. What when do I become an alcoholic. Not that I want to. JT:Yeah. You know that’s a tough question because alcoholism can look very different for many people. OK. Some people will drink 24/7. Some people will be able to maintain it until 7:00 p.m. 4:00 p.m. and then drink. Some people could go for months and not pick up a drink but when they pick up that drink they’re off and running. The disease is progressive. And sooner or later they’re going to end up in trouble of some sort. And that may look different for other people whether it’s a DUI or a divorce or you know. So it’s really difficult but it’s really chronic it’s compulsive it’s relapsing as we know. And it’s progressive and people pick up where they left off. So what that picture looks like for you and I can be very different which is again makes it very difficult for people to understand addiction. And most people will look and say I’m not an alcoholic because what they’re looking at is someone worse than they are. So it’s really key how it’s impacting your life. HR:Tell our audience your thoughts on the 12 step programs. JT:My mother’s style of parenting was based on a 12 step program. I had the good fortune of having my mother get into recovery when I was two and she worked a program having reaped the benefits of that and learned to utilize it myself. Everyone would be fortunate to understand the wisdom in a 12 step program. HR:What do you feel is. You can tell our audience or parents and they have I’m just making up a number. 18 year old son who’s drinking way too much. Their fear he’s becoming an alcoholic. What advice do you have for them? JT:I have a great question. I think that one of the hardest parts of being a parent or anyone else is really taking a look at our own behavior. It’s easy to manage other people’s lives and having done parenting for many years. To me it’s really key that we role model the behavior that we’re expecting of another. So I think that’s kind of first and foremost and to help families understand that they’re really a key component in addiction or delivering a message relative to addiction or concerns about addiction unfortunately sometimes that fear gets the better of us as parents as we know and how we deliver messages we become entirely ineffective in a manner in which we do it. So my suggestion would be to really seek help seek someone that they trust in terms of helping them reframe and delivering a message in which it can be received. And I think it’s really key that they’re honest about how they feel and have resources depending upon the reaction. HR:OK I want to I want to read to our audience something you said in an e-mail that really resonated with me. I’ve been playing it over my brain but I want our audience to hear from you I’m just going to read the quote. “The need to bring about change in addiction as a brain disease is paramount.” Can you elaborate on that? JT:I again. It’s so apparent that people really don’t understand addiction as a disease let alone a brain disease. Again we’re still talking with that it’s a choice and it’s a behavioral choice. What she asked, there are behavioral changes that need to occur. But that is true of most diseases heart disease. Because I think the more we realize that it is a disease much like heart disease we can begin to remove the stigma and start to understand how we can all impact or help whether it’s before during or after. I think unfortunately not understanding that allows many people to avoid addressing concerning behavior like you was speaking to before someone that’s drinking heavily. And I think years ago we did a phenomenal job in delivering a message Don’t drink and drive. HR:Yes, I remember back- I’m so old I remember before Mothers Against Drunk Driving. It was OK, it was cool to drive drunk. But not after Mothers Against Drunk Driving. JT:I think the sad part about that was we delivered the message you don’t drink and drive in that what was heard. It’s OK to get drunk and just don’t drive. And we have a whole millennium that does not understand addiction and we do very little to educate the prevention of addiction. HR:Tell us about the place of drugs and alcohol addiction in other words pharmaceuticals drugs supposedly may in fact be harmful. What’s your experience if you’re not a doctor. JT:I am not a doctor. HR:I’m just asking you as a as a professional. JT:I think that there is a place for it. There is no question about that. Again I think that. It’s overused in many cases. I think it’s really unfortunate how we as a society. Have been how do I say this led to believe that many of the drugs that we are prescribed are safer than they actually are. And I also am concerned because many of the times when they’re prescribed the prescribers do not understand the side effects the consequences of the drugs they’re prescribing. Nor is there often a thorough history of who they are being prescribed to. I don’t think it’s intentional but I know you know our whole the whole opiate epidemic with our kids. So many have been prescribed due to sports and sports injuries and that the thought process really hasn’t been. How are they going to be impacted and how much more impacted they may be because of how young they are. And none of us know how someone’s going to react when given an opiate or any other drug or alcohol. And unfortunately for me I can’t tolerate opiates if I’ve had surgery. I can take one and I’m nauseous and sick. It’s not the case for many people. They are high from the minute they take them and it’s a high that is like no other for them. And different people respond differently to different drugs. And we really have no idea how any one individual is going to react or where that’s going to take them. So I have a hesitancy and I have a concern because again there is such lack of understanding as to where it goes from there. HR:So let’s say I’m in the audience here and I think I’m not sure but I think I might be becoming an alcoholic, ok. What are some of the immediate steps that I can do on my own that don’t cost a lot of money? JT:There are resources that are free of charge like your 12 step programs. Whether it’s for someone that’s concerned about their drinking or a family member or a loved one. We have AA or NA, and then we have Alanon which is for family members or loved ones. Which again can be a resource. And the beauty of any of your 12 step programs is you don’t even have to speak to someone. HR:You don’t have to what? JT:Speak to someone. I mean if you don’t have to speak to someone, you don’t have to sit down and have a one on one and divulge anything. You can go simply to listen. Which I think for many is a really great place to start. And from there there are resources that people can give you that they provide, there are pamphlets. HR:If audience wants to get a hold of you how do they get a hold of you. JT:They can get hold of me through my Web site which is Jantedeschi.com. JT:T e d e s c h i. And then my email is jan@jantedeschi.com. HR:Are there any final messages you’d like to give to our viewers here, our audience? Like what message do you think is paramount that you would like to impart to our audience here are Different Brains? JT:I think that if we could all stop and pause and kind of take a look at what we’re thinking and feeling and kind of replace that with compassion and understanding because sometimes that fear of not knowing kind of leads to a judgment of what we do. Now I think that we know and I think that when we get to that point if we could stop and redirect and kind of respond or even do nothing but just being be in the present moment with a more respectful compassionate caring approach. I think we could start heading in a different direction. HR:Well that’s great. And you know that’s a very positive statement. On that note we’re going to have to stop here. Great to have you. We’ve been talking with Jan Tedeschi of Marshfield Massachusetts. Parenting an addiction coach and specialist and Jan it’s been a real pleasure having you. In this episode, Harold Reitman, M.D. speaks with Colin Eldred-Cohen. 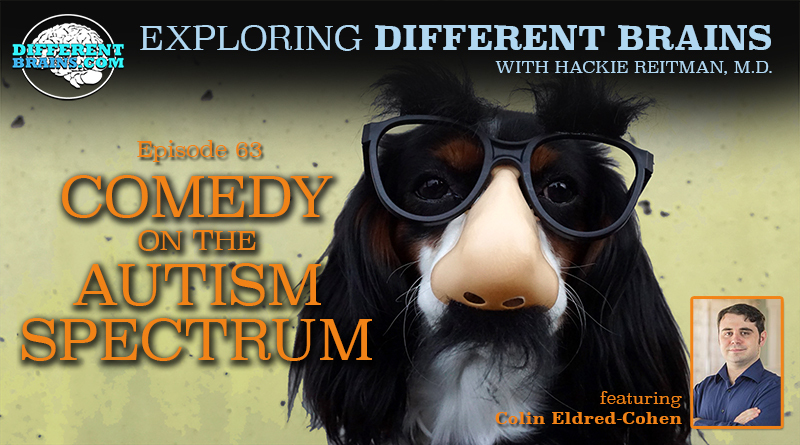 He is the author of "The Fire Truck Who Got Lost,” a movie reviewer, and a young man on the autism spectrum. 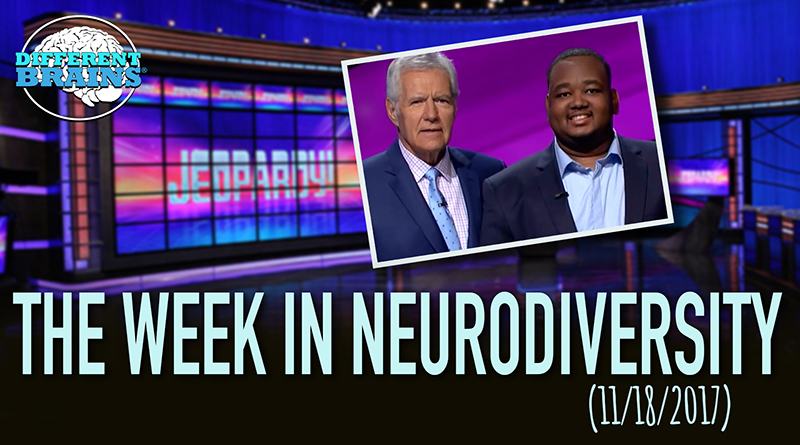 (3 mins 36 sec) In this episode, University of Iowa researchers look at a cancer drug’s effect on Parkinson’s, a neurologist discusses the facts and myths of Alzheimer’s, and a young man with Asperger’s lives his dream of competing on Jeopardy! These stories and more in this week’s edition! Dr. Hackie Reitman speaks with Denise Resnick. 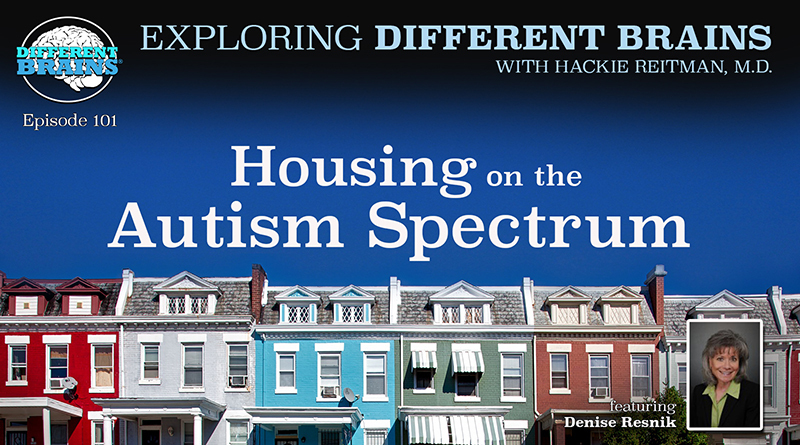 Denise is the Founder, President, and Board Chair of First Place AZ (a nonprofit dedicate to developing innovative housing options for adults with autism), as well as co-founder of the Southwest Autism Research & Resource Center.